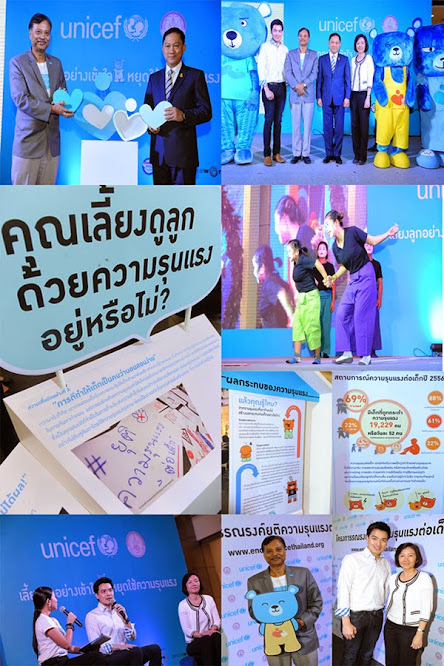 BANGKOK, 19 January 2015 – The United Nations Children's Fund ( UNICEF) and the Ministry of Social Development and Human Security (MSDHS) today launched the “End Violence Against Children” campaign aimed at creating awareness of the negative impact it has on children and urging Thai parents, caretakers and teachers to stop using any forms of violence against children. According to several studies supported by UNICEF Thailand, violence against children regularly occurs in homes, schools, care centres and juvenile justice facilities. * A study found that more than 50 per cent of Thai children surveyed said they had experienced violent punishment by their parents, caretakers or teachers. Many children suffered injuries as a result and often believed it was their fault. According to the Ministry of Public Health, which collected data from 631 hospitals in 2013, more than 19,000 children (or about 52 children per day) were treated in the hospitals due to physical and sexual abuse. The End Violence Against Children Campaign which has the slogan “Parenting without Violence”, urges parents, caregivers, and the public to change their attitudes and behavior by stopping all forms of violence and using a positive discipline approach to raising children. The campaign introduces an easy concept of “CUTE” which is Confidence, Understanding, Trust, and Empathy as the way to care for children. Under the campaign, 30-second and 15-second TV adverts about the negative impact of violence will be aired on Thai television, while messages and parenting tips will be promoted through several communication channels such as posters, leaflets, roadshow activities, online at www.endviolencethailand.org and through social media with the hashtag #ENDviolence.